Shortlisted for the 2019 Irish Times Poetry Now Award. Featured in the TLS & Irish Times Books of the Year 2018. 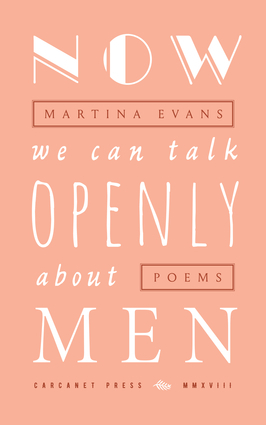 Martina Evans's Now We Can Talk Openly about Men is a pair of dramatic monologues, snapshots of the lives of two women in 1920s Ireland. The first, Kitty Donovan, is a dressmaker in the time of the Irish War of Independence. The second, Babe Cronin, is set in 1924, shortly after the Irish Civil War. Kitty is a dressmaker with a taste for laudanum. Babe is a stenographer who has fallen in love with a young revolutionary. Through their separate, overlapping stories, Evans colours an era and a culture seldom voiced in verse. Set back some years from their stories, both women find a strand of humour in what took place, even as they recall the passion, vertigo and terror of those times. A dream-like compulsion in their voices adds a sense of retrospective inevitability. The use of intense, almost psychedelic colour in the first half of the book opposes the flattened, monochrome language of the second half. This is a work of vivid contrasts, of age and youth, women and men, the Irish and the English: complementary stories of balance, imbalance, and transition.